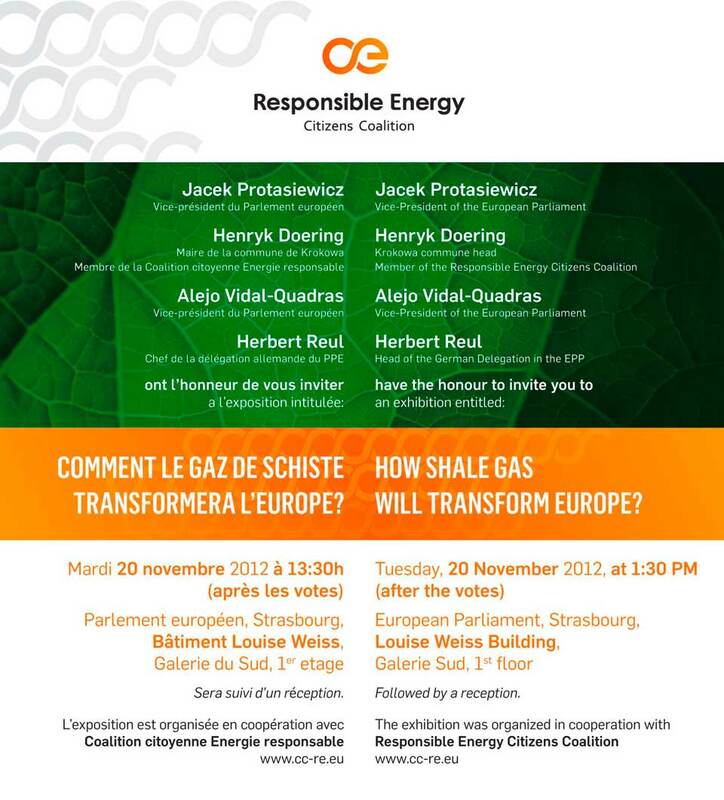 On Wednesday 21 November all members of the European Parliament were due in the plenary room of the Strasbourg Parliament headquarters to vote on two reports1 on shale gas. The day before an exhibition was set up across from the plenary room to convince MEPs that shale gas has no environmental risks and needs no further regulation. What was not visible was that the group co-organising the exhibition and subsequent reception, the Responsible Energy Citizens Coalition (RECC), is a front group for big companies with commercial interest in shale gas development, such as Polish PGNiG. RECC presents itself as an association of “natural persons, representatives of self-governments and local authorities as well as social organizations”3. Its purpose is to promote the development of shale gas across Europe and its website is full of propaganda aimed at presenting shale gas as environmentally friendly, safe and with many other benefits. Despite its lobbying activities, the Responsible Energy Citizens Coalition has not registered in the Transparency Register of the Commission and Parliament. Funded by these corporations, and presented as a citizens group, it is quite clear that the Responsible Energy Citizens Coalition is a front group for the shale gas industry. Apart from the exhibition and reception offered to MEPs, RECC sent a letter9 to MEPs before the vote asking them to vote against the proposed ban on fracking, and advertising shale gas as the only alternative that secures a supply of energy at reasonable prices, reduce CO2 and create jobs. The letter, which did not inform of the companies involvement in the RECC, also invited MEPs to attend the exhibition in the Parliament premises. The group, as well as the companies who fund it and others with an interest in shale gas (such as Shell, ExxonMobil or Total), are waging a big lobby campaign to brand shale gas as climate friendly and to downplay its devastating environment and social effects. A recent report by Corporate Europe Observatory, “Foot on the gas - lobbyists push for unregulated shale gas” maps the corporate lobbying to prevent further EU regulations for shale gas. Evidence is mounting of the grave impacts brought by shale gas exploitation, and local resistance all over Europe is on the rise. This is why, despite huge industry efforts and enormous amounts of money poured into lobbying, the Parliament vote of 21 November called for a regulatory regime to address environmental and other concerns. The vote however fell short of calling for a ban. This is not the first time that the Parliament has been used by an industry front group to try to steer MEPs with biased corporate lobby messages. Only few months ago Corporate Europe Observatory sent a complaint to the Parliament's questors (in charge of giving permission for events inside their premisis) when the ‘Bees Biodiversity Network’, a frontgroup for German chemical giant BASF, organised a series of events in the European Parliament in Brussels to divert regulators' attention from the link between pesticides and the decline of Europe's bee populations. Already the lobby battle on shale gas looks very much like David versus Goliath, with industry largely outspending civil society groups12. No need to let big corporations get away with their tricks with false citizens groups as well.